PAJEHTKA, Kamchatka, Russia -- Kurilskoe Lake is 4,000 miles and 100 years away from Idaho's Redfish Lake. One sockeye returned to Redfish Lake this year following a century of dambuilding, overharvest, and human development. More than 1.1 million sockeye returned to Kurilskoe Lake this year as nearly 5 million returned last year in one of Russia's most pristine regions. The similarities and contrasts between these two lakes highlight the connections between Russia's Far East and the Pacific Northwest. The people of the two regions can learn a lot about each region from the other. ``We're reference points for each other,'' said Mike Whitfield, a conservation biologist from Tetonia who participated in a scientific exchange in Kamchatka in September. ``It's hard for us to imagine central Idaho with rivers running red with salmon but in Kamchatka they were. Redfish Lake, a 2.6 square-mile, 300 foot-deep lake near Stanley lies at the base of the Sawtooth Mountains in the Sawtooth National Recreation Area, taking its name from the sockeye salmon that had returned annually for 10,000 years until this century. Kurilskoe Lake, a 46 square-mile, 1,000 foot deep lake, lies beneath the towering Ilinsky volcano in the South Kamchatka Reserve near the tip of Russia's wildest peninsula. 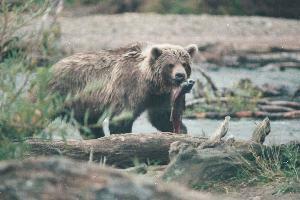 At Kurilskoe sockeye salmon spawn from spring until early winter and huge Kamchatka brown bears patrol the shoreline. Campers and hikers play on the Redfish shoreline as sailboats and waterskiers cruise the lake. The opening of Kamchatka, means its vast mineral and biological resources will be developed just as the Pacific Northwest was more than a century ago. Will places like Kurilskoe go the way of Redfish Lake? Or will Russia's Far East be developed in a manner that avoids the terrible pollution problems of Russia's more populated west and the development scars suffered in the Pacific Northwest? Throughout the Far East, lumber, mining and energy companies are rushing in to lay claim to timber, gold, oil and geothermal resources. Hunters, fishermen and ``ecotourists'' also are finding their way into Kamchatka and Siberia. Bear hunters from Japan, Europe and the United States are the most numerous foreign visitors in Petropavlovsk. The opening of the Russian frontier, its ``Wild East,'' has many similarities to the the opening of America's Wild West in the late 1800s. The end of Soviet rule has left few laws in place, especially when it comes to resource development. What laws are in place are hard to enforce with no adequate court system or appeals process. And the pressure to develop quickly is strong. Corruption is widespread and various mafias and former Soviet bureaucrats control resources and land. Yet Russia's environmental movement is strong. The severe environmental problems throughout the former Soviet Union, such as radioactive contamination, toxic waste pollution and air pollution, have energized a generation of citizens who worry about their health and safety. In Kamchatka, for instance, citizens stopped the government from building a series of hydroelectric dams that may have threatened their important salmon fisheries. A new coalition is forming to combat mining. In Siberia earlier this month, a coalition of environmentalists and Eskimoes stopped a Korean timber venture in a roadless area important to the survival of the Siberian tiger. However, times are hard throughout Russia. Prices have risen 20 times during th last year. While food, clothing and other necessities of life are available in good supplies, the value of paychecks has not kept up with prices and people can't afford even the basics. The need to develop natural resources for precious foreign currency and jobs is high. Russians can't afford to stand still. In the government and scientific community, the economic problems also have taken their toll. Money for managing the huge preserves set aside in Kamachatka and for scientific research has been cut in half. Revenko, 33, had not received any funding for his research this year. With a paycheck of only $12 a month, just surviving is hard. Sergey Alekseev, director of the Kronotsky Natural Reserve, a Yellowstone-sized national park filled with geysers, bears and 22 active volcanoes, said he has only received half of the 7.5 million rubles, about $37,500, promised him by Moscow. Yet he must pay 50,000 rubles or $250, per hour for helicopters to take he and his staff of 40 rangers and 13 scientists into the isolated reserve about 100 miles north of Petropavlovsk. ``They have a lot more to worry about than nature protection,'' he said through an interpreter. Alekseev, a dashing, blond 34-year-old manager, wields nearly absolute control over Kamchatka's reserves. He came to Yellowstone and Grand Teton national parks in 1990 to study how they were managed. When he returned, he approved and helped organize a concessioner to offer helicopter tours into Kronotsky. The company, Sokjoi, which means male reindeer, formerly was involved in the fur trade and also is the exclusive outfitter for bear hunters in Kamchatka. The park takes a percentage of the profits in exchange for an exclusive contract for tourism in Krontosky. Alekseev said he patterned the relationship on Yellowstone's concessioner, TW Services. Unlike Yellowstone, Kronotsky only can be reached by helicopter and Alekseev allowed only about 2,000 people into the park's most popular feature, the Valley of the Geysers. And Alekseev said he never will allow Kronotsky to develop the kind of tourism development, roads, ice cream stands and parking lots he saw in Yellowstone. The difference between Alekseev's arrangement with Sokjoi and Yellowstone's with TW Services, is that he serves on the Soczhoy's board of directors, which would be considered a blatant conflict of interest here.On the surface, the exclusive contract appears to help protect Kronotsky. When another tourism company brought a helicopter of Japanese tourists to the Valley of the Geysers earlier this year, they were met by Sokjoi employees with machine guns, who forced them leave. Sokjoi also has joined environmentalists in opposing the hydroelectric project, recognizing like many recreational companies in the United States that certain development threatens their business. In Kamchatka, like the American West, the economy is highly dependent on the military. Petropavlovsk, like Idaho Falls, must adjust to the ending of the Cold War. The size of Russia's military, like ours is trending downward. The Soviet Pacific Fleet, with its hundreds of ships and submarines that are based in the strategic harbor, is bound to get smaller. With its distance from Moscow, Kamchatka's only economic option appears to be to develop its natural resources. The fishing industry already is highly developed both in the ocean and on salmon rivers. Reindeer herding supports the Koryak natives of the North and agricultural areas surround Petropavlovsk. The potato harvest was in full swing while we were there and the fields were full of farm workers digging the potatoes by hand. The ample geothermal steam available supports thousands of hot houses in and around the city where tomatoes, strawberries, cabbages and other vegetables are raised well into the winter. The steam has captured the attention of electric energy developers, who seek to use the geothermal energy to produce not only enough electricity to meet Kamchatka's need, but also perhaps some of the need of Japan to the south. Icelandic engineers have proposed building a huge plant near Petropavlovsk wheeling the surplus power by ocean cable down the Kuril Islands to northern Japan. A small geothermal plant in Pajehtka near the southern tip of the peninsula provides power for two villages, a large farm cooperative and a canning factory. The plant, built in 1966, is crude and in disrepair, but plans are in the works for expansion. In the adjacent South Kamchatka Reserve geologists are drilling another geothermal area to study the feasibility of building a larger geothermal plant. Siberia mining interests are attempting to open gold mines in central Kamchatka. Japanease and American timber interests have their eyes on Kamchatka's timber. Many Russians expressed skepticism that their engineers could develop their resources without making a mess. Petropavlovsk's harbor is contaminated with nuclear waste that has been dumped by the Soviet Fleet. The timber, mostly low-value larch, is extremely hard to reforest because of the climate, soils and permafrost that underlies much of the forests. Alexander Kuragin is the director of the Pajehtka geothermal power station, which had only one generator operating. The geothermal basin from which it pumps steam once had geysers, villagers said. Today, the basin is subsiding and U.S. Geological Society geochemist Irvin Friedman said there is a high probability that the subsidence is caused by the plant. Kuragin said he doubts Russia's bureaucracy can develop new geothermal or other natural resources wisely.